There are many things to consider when shopping for blank DVD-R media. With so many top DVD-R brands, such as Taiyo Yuden, Verbatim, Ridata, MAM-A and GotMedia.com in Orange County, CA, many different surfaces for DVD-R media such as inkjet printable and thermal printable, and so many different uses and applications for DVD-R blank media, it can really be tough to find the right solution for your specific needs. 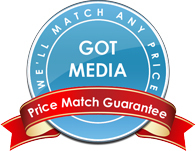 This is why GotMedia.com has organized only the highest quality dvd-r media products by these top brands to help you find the right DVD-R for whatever your needs may be; and all of them offered only at be best prices available! Please browse some of our top DVD-R media sellers below, and feel free to give us a call at 1-866-409-1090 if you'd like any assistance in finding the right DVD-R media product for you and your bulk dvd-r media needs. MAM-A Mitsui has a reputation for excellent quality blank DVD-R media. MAM-A Mitsui 16x DVD-R 163119 has a shiny silver thermal printable surface for users that want to print with a monocolor thermal printer, apply a label or just simply write on the surface with a DVD pen. MAM-A Mitsui has a reputation for excellent quality blank DVD-R media. MAM-A Mitsui 16x DVD-R 163120 has a silver inkjet printable surface for use with a color inkjet printer. The silver inkjet surface gives colors an iridescent look. You can also write on the surface with a DVD pen. MAM-A Mitsui has a reputation for excellent quality blank DVD-R media. MAM-A Mitsui 16x DVD-R 163131 has a white thermal printable surface for use with a monocolor thermal printer. You can also write on the surface with a DVD pen. MAM-A Mitsui has a reputation for excellent quality blank DVD-R media. MAM-A Mitsui 16x DVD-R 163159 has a white thermal printable surface for use with a color thermal printer. These are also hub printable which means you can print on more of the surface and closer to the center hole. The print surface is Everest approved. You can also write on the surface with a DVD pen. MAM-A Mitsui has a reputation for excellent quality blank DVD-R media. MAM-A Mitsui 16x DVD-R 163158 has a silver thermal printable surface for use with a color thermal printer. These are also hub printable which means you can print on more of the surface and closer to the center hole. The print surface is Everest and P-55 approved. You can also write on the surface with a DVD pen. MAM-A Mitsui has a reputation for excellent quality blank DVD-R gold media. MAM-A Mitsui 8x gold archival DVD-R 83437 has a gold matte finish thermal printable surface for users that want to print with a monocolor thermal printer, apply a label or just simply write on the surface with a DVD pen. MAM-A Mitsui 8x gold DVD-R 83443 has a white inkjet printable surface for users that print with a color inkjet printer or simply write on the surface with a DVD pen. These also have an edge to edge print surface which allows printing over most of the disc top surface. MAM-A Mitsui 8x gold DVD-R 83449 has a gold inkjet printable surface for users that print with a color inkjet printer or simply write on the surface with a DVD pen. These also have an edge to edge print surface which allows printing over most of the disc top surface. Spin-X DVD-R media offers great value for the user because they have good compatibility with many burners and players, plus they are inexpensive. These DVD-Rs have a shiny silver surface which is best suited for users that want to print with a monocolor thermal printer, apply a label or just simply write on the surface with a DVD pen. Spin-X DVD-R media offers great value for the user because they have good compatibility with many burners and players, plus they are inexpensive. These DVD-Rs have a white inkjet printable surface for users that want to print with a color inkjet printer. They are hub printable which means you can print on more of the surface and closer to the center hole. You can also write on the surface with a DVD pen. Spin-X DVD-R media offers great value for the user because they have good compatibility with many burners and players, plus they are inexpensive. These DVD-Rs have a silver inkjet printable surface for users that want to print with a color inkjet printer. The silver inkjet DVD-R gives colors more of a iridescent look. These are hub printable which means you can print on more of the surface and closer to the center hole. You can also write on the surface with a DVD pen. Spin-X DVD-R media offers great value for the user because they have good compatibility with many burners and players, plus they are inexpensive. White thermal DVD-R is best used with a color thermal printer like the Rimage Everest II or Teac P-55. These DVD-Rs are hub printable which menas that you can print beyond the stacking ring, closer to the center hole. You can also write on the surface with a DVD pen. 16x Blank DVD-R from Spin-X is part of the next generation of recording speed for DVD-R. Spin-X has been making quality DVD-R for many years offering reliability at a great price. These 16x DVD-R have a shiny silver top surface for use with a monocolor thermal printer, paper label or DVD safe pen. These Spin-X 16x DVD-Rs have a white inkjet printable surface for use with color inkjet printers. They are hub printable which means you can print on more of the surface and closer to the center hole. They are 16x burn speed. Spin-X makes a quality blank DVD-R at a low price. These Spin-X 16x blank DVD-R have a silver inkjet printable surface for use with a color inkjet printer. The silver inkjet DVD-R gives colors more of a iridescent look since the background is silver rather than white. These are hub printable which means you can print on more of the surface and closer to the center hole. Spin-X 16x blank DVD-R media with a white thermal print surface that is compatible with a color thermal printer like the Rimage Everest II or Teac P-55. These DVD-Rs are hub printable which menas that you can print beyond the stacking ring, closer to the center hole. You can also write on the surface with a DVD pen. CMC Pro is premium blank 16x DVD R media with superior reliability and compatibility. These DVD-Rs have a shiny silver surface for users that want to print with a monocolor thermal printer or apply a label. CMC Pro (formerly JVC & Taiyo Yuden) is premium blank 16x DVD R media with superior reliability and compatibility. These DVD-Rs have a white inkjet printable surface for use with a color inkjet printer. These are hub printable which means you can print on more of the surface and closer to the center hole. CMC Pro (Formerly JVC & Taiyo Yuden) is premium blank 16x DVD R media with superior reliability and compatibility. These DVD-Rs have a silver inkjet hub printable surface for use with a color inkjet printer.The silver inkjet surface gives colors an iridescent look. CMC Pro (Formerly JVC & Taiyo Yuden) is premium blank 16x DVD R media with superior reliability and compatibility. These DVD-Rs have a white thermal printable surface for use with a color thermal printer. These are also hub printable which means you can print on more of the surface and closer to the center hole. The print surface is Everest and P-55 approved. CMC Pro is premium blank 16x DVD R media with superior reliability and compatibility. These DVD-Rs have a waterproof white inkjet printable surface for use with a color inkjet printer. These are hub printable which means you can print on more of the surface and closer to the center hole. Taiyo Yuden Watershield CD-R has a glossy finish and is smudge and water resistant after it has been printed. The print quality looks amazing! CMC Pro (Formerly JVC & Taiyo Yuden) Value Line is media that passes quality control tests at the lower range of the quality scale. These DVD-Rs offer great value. White inkjet printable surface for use with a color inkjet printer. Hub printable which means you can print on more of the surface and closer to the center hole. If you are new to DVD recording you will want to know the format that your DVD recorder will accept, DVD-R or DVD+R or both. You will need to purchase the proper format for your recorder. You will also want to know what speed your recorder is. If you have a 16x drive you will be able to record a DVD anywhere from 1x to 16x. You can purchase 16x media and reap the benefits of faster recording. You can also purchase 8x or 4x media that will work just fine in your 16x drive even though it will not burn at 16x. If you have a 4x DVD recorder and you purchase 16x media it will not burn faster than 4x. The record speed of your DVD recorder is the maximum speed that you can record. All consumer or standalone DVD recorders are "real time" and therefore burn at 1x. This does not mean that you have to purchase 1x media. You can use any speed media as long as the format is compatible with your recorder DVD-R or DVD+R. Brand is probably the most important thing to consider when you are shopping for a blank DVD-R. A quality brand will almost always be the best choice for any application whether it be archiving, master recording, duplicating or just burning a DVD to watch on your TV. Quality brands are made to perform better, last longer and have the most universal compatibility across various DVD players. If you want your burned DVD to play in 95+% of DVD players that exist then you should stick with brands known for quality. Verbatim, Taiyo Yuden and MAM-A have been known to produce the highest quality DVD-R media. Spin-X and Ridata are also good manufacturers. If you need help choosing the right blank DVD-R, then we are only an email or phone call away.